Well! These socks almost broke me. They were originally meant to be a birthday gift for Jason. He had been wanting a pair of crochet socks, which is only fair seeing as I’ve been making a pair for myself every month for almost a year. I got started – I took Jason’s foot measurements, taking note of the high arches, and then ignored them. Big mistake. Big. Huge. When he tried to put on the socks they wouldn’t go past the leg of the sock. Not even the awkward heel/ankle part, but the leg! And the toes were too long. So I went back, but thankfully only had to frog them to just before the ankle (toe-up socks). 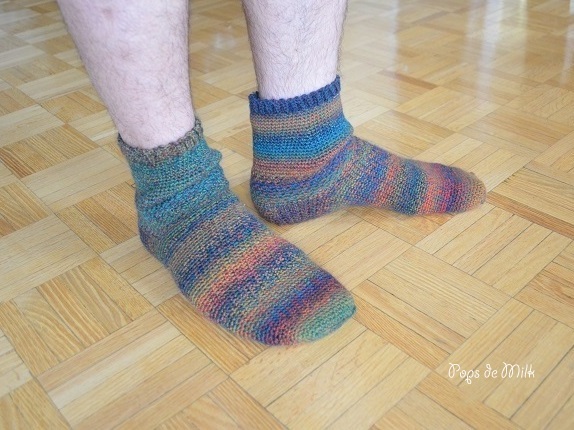 I made several modifications to the basic crochet sock pattern by Nicole on Simple Sock Making. For the ankle/heel I used the block stitch (alternate rounds of *sc, ch1, skip* around and rounds of *sc, 2sc in ch sp* around), a very good recommendation by the super helpful Jennifer from Squirrel Picnic. Eventually I made it through that part of the sock, that part that determines whether the sock will fit or not. The next bridge I had to cross was the gigantic leg – I had been increasing after all – but by now I was ready for it. I knew not to start decreasing until nearer to the cuff otherwise all that ankle/heel work would be a waste (can you imagine!). When I reached the top I got my second wind and started working on the ribbed cuff. I really like the technique used in the Red Heart – Heart and Sole sock pattern (I used it for my July and August socks), it gives the socks a neat finish and adds a little variety after endless rounds of single crochet. Jason put on the finished socks, there was a minor struggle but they fit. “I feel like I’m walking on someone’s sweater,” he said walking around. This was his first time wearing crochet socks. Do you remember your first time? 1. Choose durable but stretchy yarn. 2. Make sure the person doesn’t have allergies to wool, if using wool. 3. Keep a notebook and pencil handy for sudden changes, somehow feet grow when you’re not looking. 4. Buy enough yarn. Buy enough yarn. I had to say it twice because I ran out as I was starting the second leg and just think what would have happened if Michael’s didn’t have the same yarn? 6. And most importantly, don’t ignore the measurements.